Yes, the expression, Customer-Centricity carries a nice ring with it, but the reality remains that nice-sounding words hardly carry the same gravity as the actions that go with them. That is the story of customer-centricity as it relates to words vs action. Many are tempted to ask what it really means to be customer-centric? Other who know may further ask: “What does it take to be and remain customer-centric? Yes, it’s become obvious given that customer-centricity has several definitions. Depending on which industry and what line of business one is involved in, to be customer-centric is simply saying that your customers are at the centre of your business objective(s) but what does it really mean to be customer-centric? Customer Centricity can be defined as a commitment to creating a set of exceptional values for customers, which includes considering their business needs and how to meet them above immediate gains. This does not translate into doing business without targeted profits. It simply means making the customer happy always, the core of your service orientation, while you also make sustainable business profit. In fact, customer-centricity is a mission statement with clearly defined and measurable objectives. For us in Fortune Global, we have taken the subject of customer-centricity beyond a promise that sounds nice to clearly defined actions that accentuate our commitment to offering our esteemed customers seamless services, at affordable costs, while ensuring that the appropriate tools and the best professional help is always also offered. At the heart of every corporate objective we have ever articulated, customer-centricity has always been a key consideration. At the heart of our aspiration to be a first-choice logistics and freight forwarding company in Africa; go global and maintain an unblemished record of excellence is our customer-centric orientation. Our commitment to customer-centric issues ranging from competitive rates to efficient service delivery is an integral component of our corporate culture. The culture of excellence has become so firmly ingrained that it ultimately translates to a very robust operational process that distinguishes Fortune Global from its industry peers. Our team of experienced industry experts handsomely deploy this inbuilt culture of excellence in managing diverse freight and contract logistics at all times. 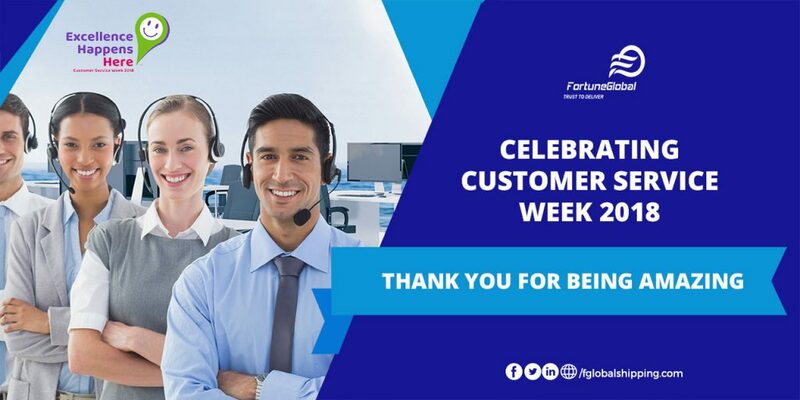 Finally, may we also cease this opportunity to celebrate our customers, all customer services representatives and professionals in several industries across the globe for making the mission of giving the best to all customers a global possibility?